How about “A Snack and Drink Rebate” Program to Boost Employee Productivity? Snacks and drinks help significant increase in employee productivity. According to a study by vouchercloud.com, office workers spend an average of 25 minutes of an eight (8) hour shift consuming snacks and beverages. 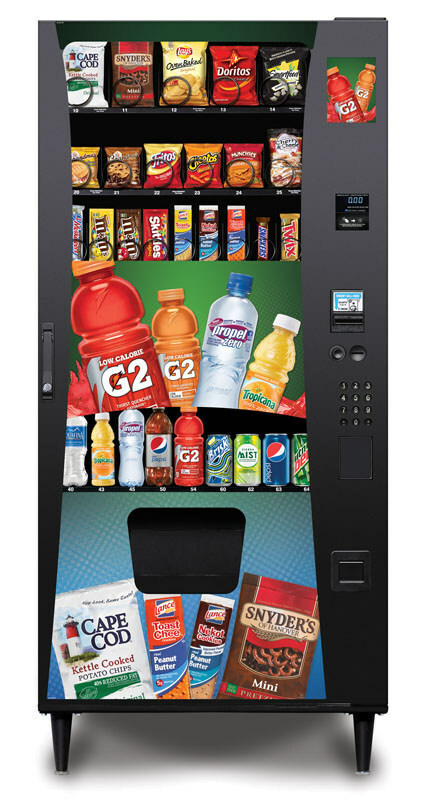 Taking lead from this idea further, Selectivend, a leading manufacturer of full-service vending solutions has announced a special “Snack and Drink*” rebate program on the Advantage Plus, a combo snack and drink vending machine. By offering employees refreshments through on-site vending, business owners and organisations can provide employees with the convenience of a wide selection of easily accessible snacks and beverages, while improving the productivity of their workforce. “According to a study by Staples, employees find themselves taking anywhere from one to five out-of-office trips a day for drinks and snacks. This result in 2.4 billion hours lost in productivity in the U.S. each year. Just imagine the impact on your employees’ productivity and overall, your company. By supplying delicious, nutritious and healthy snacks that are readily available, it cuts down on out-of-office field trips. Yes, having snacks in the office will definitely help to increase employee productivity,” Tropicalfoods.com reported. Under the rebate program, brand name food and beverage products including Gatorade, Propel Fitness Water, Tropicana juices, Nestle Pure Life bottled water, Lance sandwich crackers, Cape Cod potato chips, and Snyder’s of Hanover mini pretzels are available to consumers free after rebate. “Providing refreshments via on-site vending increases employee productivity and eliminates the need for employees to travel off-site. This also requires employees to spend less time preparing refreshments. In addition, it makes employees feel that their convenience is taken into account and the time it saves them is appreciated,” said John Schofield, Vice President of Club Sales at Selectivend. This idea of snack and drink rebate program is a fabulous opportunity for business enterprises and organisations alike to improve the productivity of their workforce and increase employee morale by providing on-site access to refreshments. According to a recent WorkSphere survey conducted by Harris Poll on behalf of the staffing agency Spherion, if you want a happy worker, then feed them. Around 30% of respondents said the availability of food throughout the day contributes to their workplace happiness. However satisfied employees needn’t necessarily be the most engaged workforce, but the impact, free lunches have on highly productive outcomes of the talented workforce cannot be ignored. “So while pizza every Friday is a great perk, it will likely not change the overall satisfaction of an employee if basic needs are not met first,” says Steve Moore, director of human resource operations at Insperity, an HR service provider. “Companies that will do little things for employees are already doing big things for them, such as articulating an exciting vision, mapping career paths, providing real-time feedback and mentoring, and creating an environment of high performance,” as stated in the report by fastcompany.com. “If a company’s culture is not healthy, then the offerings the company provides its employees, such as food, day care, or concierge services, run the risk of being viewed as bribes versus perks,” says Greg Bustin, author of ‘Accountability: The Key to Driving a High-Performance Culture’ (McGraw-Hill; 2014).